Journal of Hydrology has an open access mirror journal Journal of Hydrology X, sharing the same aims and scope, editorial team, submission system and rigorous peer review. 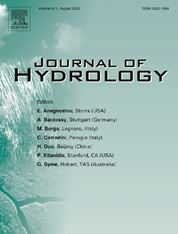 Journal of Hydrology publishes original research papers and comprehensive reviews in all the subfields of the hydrological sciences, including water based management and policy issues that impact on economics and society. These comprise, but are not limited to the physical, chemical, biogeochemical, stochastic and systems aspects of surface and groundwater hydrology, hydrometeorology, hydrogeology and hydrogeophysics. Relevant topics incorporating the insights and methodologies of disciplines such as climatology, water resource systems, ecohydrology, geomorphology, soil science, instrumentation and remote sensing, data and information sciences, civil and environmental engineering are within scope. Social science perspectives on hydrological problems such as resource and ecological economics, sociology, psychology and behavioural science, management and policy analysis are also invited. Multi-and interdisciplinary analyses of hydrological problems are within scope. The science published in the Journal of Hydrology is relevant to catchment scales rather than exclusively to a local scale or site. Studies focused on urban hydrological issues are included.